Keep your e-mail data safe by creating Outlook backup. Novosoft Office Backup is a usable and reliable backup software designed for backupping and restoring your documents and important files. Novosoft Office Backup is designed to work with just about any type of storage media, including: CD-R/RW, DVD-R/RW, HD-DVD, Blu-Ray media; SFTP or remote FTP servers; local network drives; ZIP, JAZ, MO; USB-flash; HDD and floppy disks. Automatic backup of most frequently used applications: Outlook, ICQ, AOL IM, registry, etc. Email backup via POP3 directly from the mail server. 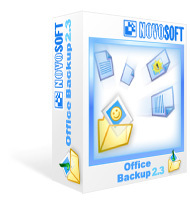 If you are looking for a simple yet powerful backup utility, you have just found it - Novosoft Office Backup.